This stage is completed and I already like the feel it has. Next I will begin the background. 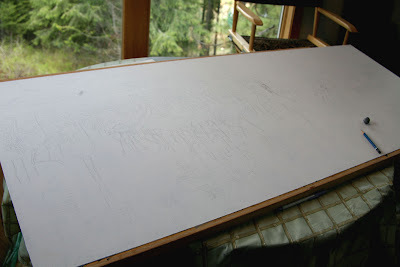 As I mentioned, a painting this large (24" X 60") takes some extra planning in its execution. For Stage 2, I do a rough drawing of my subject(s) using a 4H pencil. Here I have the gessoed board on a drawing shelf. I then prop up the backside with an array of big fat art books. The thick drawing board gives the 1/4" gessoed painting board adequate support and helps prevent warping. Stage 3. One of my signature painting techniques is to paint an underwash. I do this for several reasons. One, it seals in my drawing so the pencil outlines do not smudge. Two, it tones the board so I am not fighting a white surface. Three, it gives me a value study which I can evaluate before I start with my full-strength oil paints. Lastly, a tonal underwash can lend in making the painting read more alive and more vibrant when small areas underneath shine through. For my wash I use a mixture of raw sienna and burnt sienna (heavy on the raw sienna). 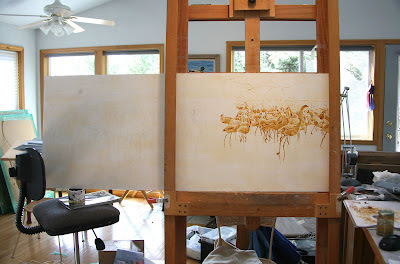 With a turpentine-wet brush I dip it in the paint and do a light wash over the entire board. Then I go back and use more concentrated color for my value study. With a board this long, I needed support on the far left edge. My extra painting chair with one ABS round and 2 magazines did the trick. Note the cat in the left hand corner. Her name is Pebbles and though she hasn't proven to be an indispensable assistant, she has just started coming to the studio.... to help. 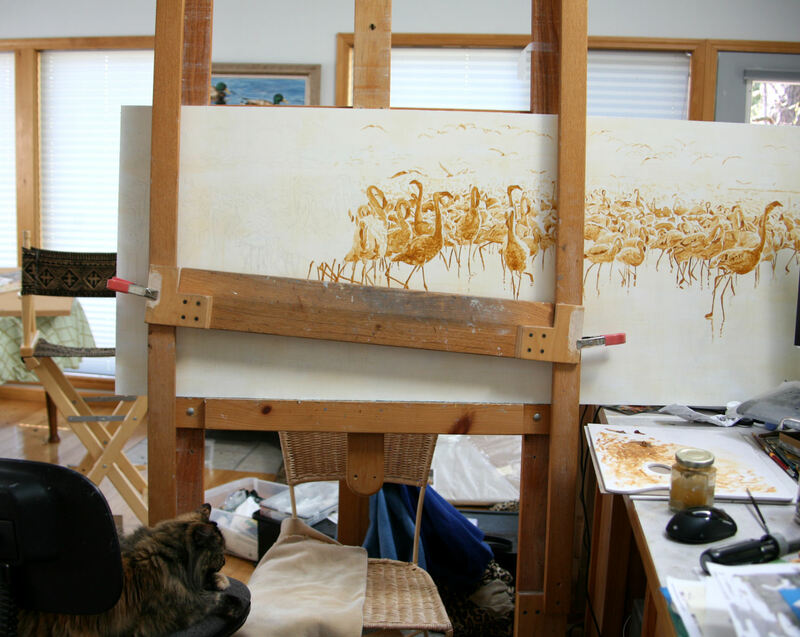 Saturday, April 21st I am the Featured Artist of the Day on the Artists for Conservation web site. If you have not visited this site (or it has been a while), take a look at all the good work artists are doing to support nature. This is particularly appropriate because Earth Day is Sunday, April 22nd. I find painting oversize pieces a lot of fun. You can really tell the whole story because you are not limited by space. A note on gesso. I had been unsatisfied with the gessos I was using. 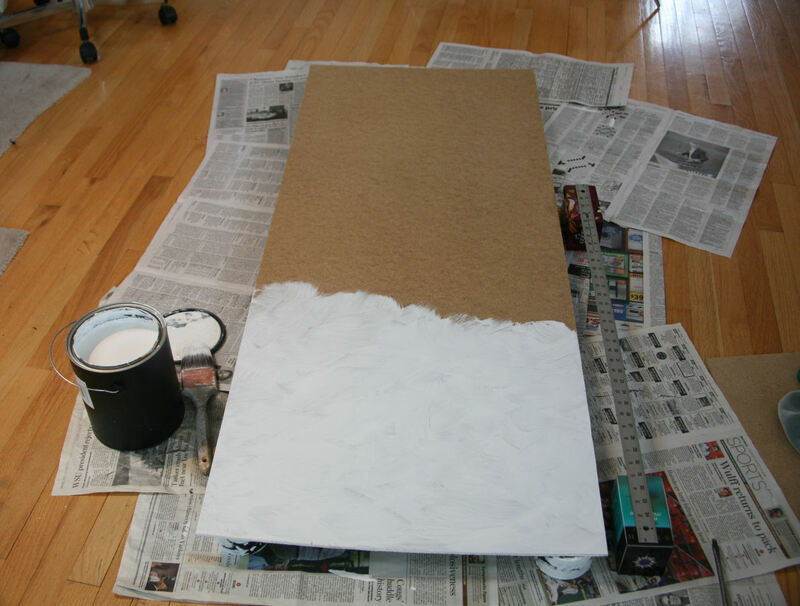 One day I googled "Artist best gesso" to see if I could find a better one. One of the listings that came up was Daniel Smith World's Greatest Gesso. Yeah, yeah. Sounded like a lot of bragging to me, but I ordered a gallon of their white. It is the very best gesso I have used. Just the right texture, not too thick nor thin and it nicely "grabs" oil paint. Rather than A Cool Finish, maybe I should say a Cold Finish. 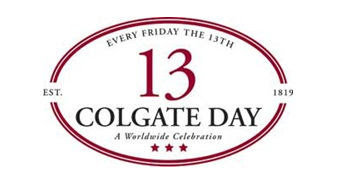 Every Friday the 13th is proclaimed Colgate Day by Colgate University. I attended Colgate University, the institution of higher learning which began with 13 men with 13 dollars and 13 prayers in 1819. When I chose Colgate University for my undergraduate degree, I did not know how prominently the number 13 was associated with the college. Why do I bring this up? Today is not only Colgate Day, it is also my birthday. So I will don my Colgate sweatshirt and recall fond memories of my time there while I blow out the candles on my cake! To strive as they strove then. With the penguins added, I have gone back to working on the water. The splashes and sparkles I will save for last. Now that the water is blocked in, it is time to start on the penguins. Since I am working in the middle of my oil painting (which is wet), I have installed my uprights to hold my horizontal handrest. Before I got too far on the penguins, I had to fix something that was bothering me in the background. If you look at the first image on this post, in the upper left corner the dark shape (the rocks of Antarctica) hit the water in a point. I found this distracting especially since it was so similar to the shape between the penguins. In this image, you can see I covered the very lowest of the rocks with snow. As I have mentioned in previous posts, I really enjoy painting water. There are so many colors, reflections, and moods you can portray. Ice is another beast altogether. Even though I have always lived in northern climes, painting ice does not come as naturally for me. When I paint whites, I start with titanium white. Most of the time I mix in a tiny amount of cadmium yellow deep to create a more natural white before I apply it to my board. In this case, I wanted a little bit cooler white for my pack ice. With a base of titanium white, I started by adding a smidgen of lemon yellow. To that mixture I added a teeny amount (these are very exact measurements) of cad. yellow deep. For the shadows in my pack ice I used mixtures of titanium white, viridian, paynes gray, and ultramarine blue. I've now moved on to blocking in the water.